The official Porsche Calendar for 2009 shows twelve detailed views of high tech components to which Porsche sports cars owe their efficiency. Whether double-clutch gearbox, Variocam Plus or direct fuel injection - the larger-than-life close-ups of technical devices, standing for lower fuel consumption and reduced CO2 emissions, provide a fascinating back-drop for the current Porsche models. Following tradition, the calendar, in the format 59 x 55.5 cm, incorporates a collector's coin and costs 35 Euro including VAT. 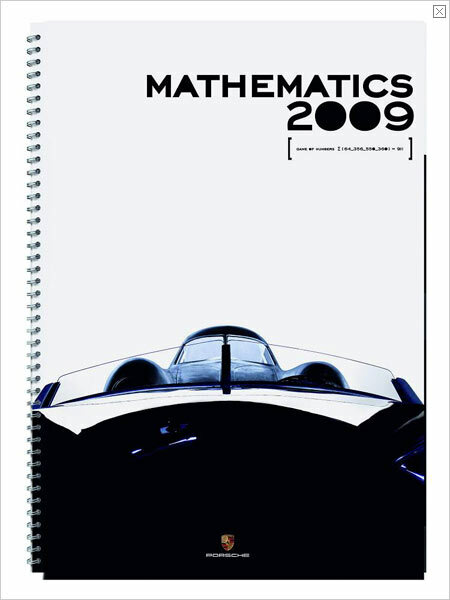 The Porsche historical calendar for 2009 with the title "Mathematics 2009 - Game of Numbers" presents the origin of the sports car manufacturer's language of form. As in previous years, the photographer Frank M. Orel has undertaken the artistic composition of the historical calendar. A vertical spiral binding centrally divides the calendar, which measures 30 x 42 cm (60 x 42 cm when opened out). Stowed in its accompanying slipcase, it will retain its interest as a photographic collection way beyond the year 2009. This calendar is also priced at 35 Euro inclusive of VAT. The Porsche designers from Weissach once again created the "Style Calendar" for 2009, which is entitled "affinities - Verwandtschaften". In this calendar, too, the focus is on the Porsche Type 64. The drawings highlight the affinities between the expression of form in the Type 64 and in the current Porsche automobiles. Included with the calendar, which measures 70 x 50 cm, is a CD-ROM with a striking screensaver. The calendar costs 57 Euro including VAT. The spiral bound date planner offers a refreshingly low-tech escape from your smart phone or BlackBerry. The luxuriously produced date planner for the coming year features photographs illustrating the rally history of the Stuttgart sports car manufacturer from 1950 to 2008. Spirally bound in DIN A5 size, it costs 38 Euro inclusive of VAT. The four calendars and the date planner can be ordered over the Internet at www.porsche.com/shop and will also be available from Porsche centers. While some of these products may only be for sale in certain countries, you can always pay the extra freight to bring one home to yours! !